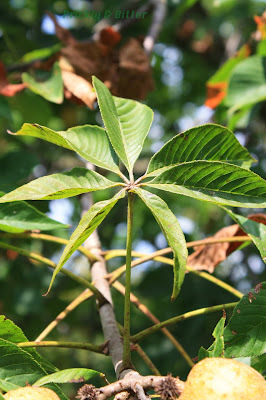 I know I've written a blog about the Ohio buckeye before (you can read my previous blog post HERE), but I wanted to blog about it again but with better pictures. And you know what? 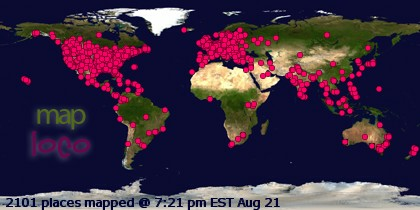 I'm allowed, because it's my blog :) So there! The Ohio buckeye is a native species (well, marginally native. Definitely native to the northeastern United States; debatable whether or not it's native to southwestern Ontario) that does very well in full sun to partial shade. It's a medium-to-small tree in this part of Ontario because it's growing in a suboptimal part of its range, but further south into Ohio and Kentucky it can be a medium sized tree (up to 25 meters tall). The roots of these trees can tolerate intense rain and can tolerate temporary flooding, but do best in well-drained soil. There are some clear disadvantages to growing the Ohio buckeye as an ornamental species, and the first should be obvious: the fruit produced. If you're trying to increase the squirrel population, growing buckeyes in your yard is one of the best things you could possibly do. 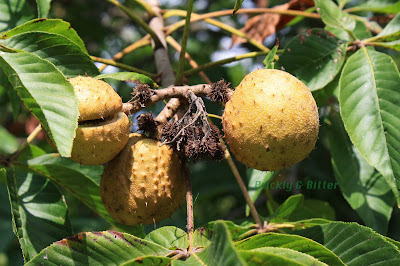 You don't want to come between a hungry squirrel and a buckeye tree! If, however, you have a lawnmower that you appreciate using and not replacing the blade every time you cut the lawn, you might want to reconsider this species. 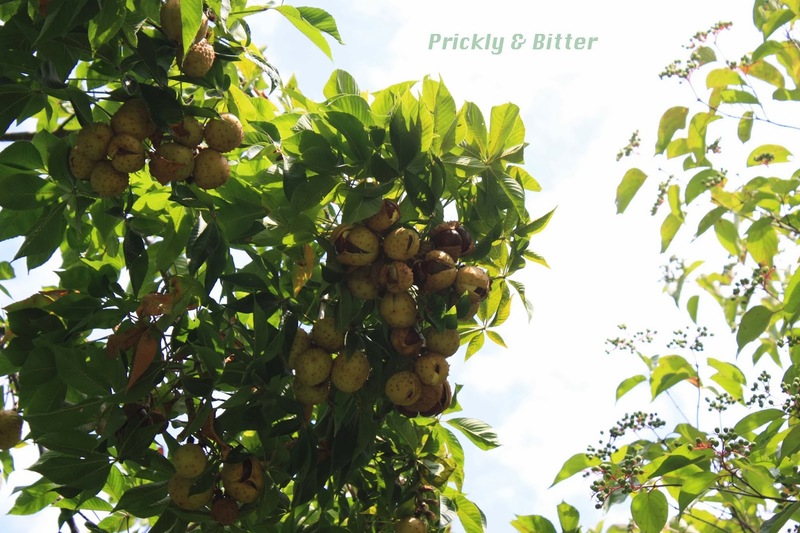 The fruits produced are enormous (in ideal conditions, some are almost the size of baseballs! ), and when they split open they release one to three seeds. The seeds are large, hard, and really hurt when they hit you in the head. They do make fantastic ornaments, and are really stunning in flower arrangements. You can also collect the seeds and dry them to make beads, as is popular to do at Ohio State University. I can imagine they would be good for building neck muscles because they're so heavy, although I'm not sure why you would want to build your neck muscles. 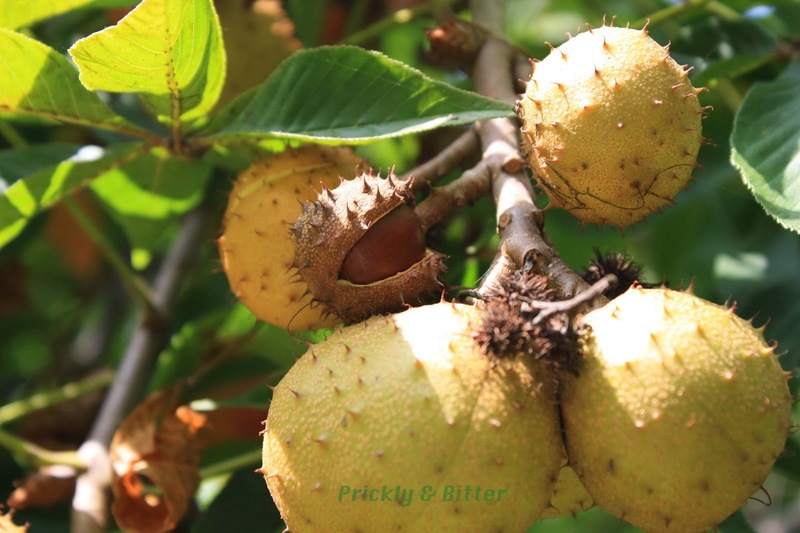 Something that is often believed about the buckeye is that it produces inhibitory chemicals from the roots to prevent the growth of other species (called allelopathy) like in Norway maples and, to some extent, black walnuts. Fortunately, this isn't the case. 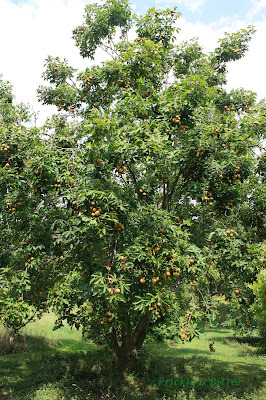 To date there's no evidence that buckeyes produce allelopathic chemicals from their roots. Unfortunately, that doesn't mean that anything will grow under them! The canopy cover of buckeyes is just so dense that even shade-tolerant grass has a really hard time growing under buckeye trees. The best thing to plant under them would be highly shade tolerant ground cover, but even that might not do it in the long run. But the trade-off? Look at the trees! They're spectacular in their own right. They also turn bright orange early in the fall (late summer, really), long before other species start to change colour. And who doesn't love a bright orange tree in a sea of green?! So how did the buckeye get to be so closely associated with Ohio? Well, there's the obvious reason that Ohio is the middle of the range for the buckeye, but that in its own right rarely causes a plant to be so ingrained in a state's culture. The story goes that Colonel Ebenezer Sproat arrived in what is now the United States in 1788 to command the Northwest Territory. Once he landed, the Indigenous peoples called Colonel Sproat "Hetuck" because they were so greatly impressed by him; he showed the native people immense respect and communicated with them instead of at them (as so many others did, and, to some extent, continue to do). To Indigenous North Americans, hetuck means the "eye of the buck" which shows power, respect and knowledge. I guess being called the eye of the buck is a great honour! He eventually became known as the "Big Buckeye" and all of the citizens under his control were his buckeyes. Eventually it became a term associated with all of those from and living in Ohio. 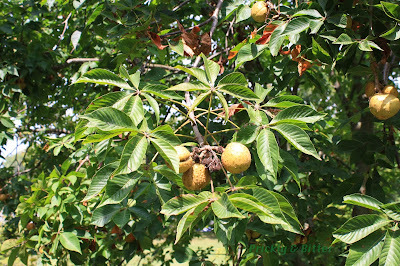 The common name of the buckeye also stems from the fact that the seeds (or the "nuts") of the tree also resemble the eyes of deer. I bet you'll never look at a buckeye seed the same way again!